The Lady Cavs try to prevent a score. 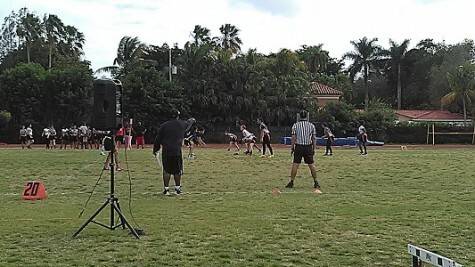 The Lady Cavaliers competed in the first ever girls’ flag football game at Gables on Tuesday, March 10 against the Miami High Stingarees. Sadly, the game did not go the Lady Cavaliers’ way, and they suffered a 26-0 loss. The Cavs put all their heart and determination into the game, but turnovers and tough defense by the Stingarees in the red zone kept the Cavaliers from scoring. The girls are sure to improve and are already looking forward to their next match against Miami High. “I think the first game gave us an opportunity to fix our mistakes and learn from the experience to get better,” senior Margarita Padin said. The Cavaliers line up on offense. Miami High started off quickly and managed to score their first touchdown very early in the first quarter. However, the Stingarees were unable to get the extra points and the score started off 6-0. The Lady Cavs looked very strong during their first possession and used a variety of running plays to penetrate deep into the opposing team’s territory. However, the Cavs came to an abrupt halt as they neared the end zone and eventually turned the ball over on downs. The remainder of the first quarter did not see much action, but the start of the second quarter saw another touchdown by Miami High, and this time they were successful on the two point conversion. This brought the score to 14-0; the Lady Cavs marched down the field intent on cracking the goal line. Once again, they were stopped by the Stingarees’ defense as an interception prevented the Cavaliers from scoring and eventually led to another touchdown. The third quarter ended with no further scoring as both teams used great defense to prevent either from getting near the end zone. However, the Stingarees managed to score one more time on a pick six. The game finished with a score of 26-0 – the Stingarees walked away with the victory. The Cavaliers try to break through for a first down. “The first game was a rough start, but practice is key. We tried our best, but we didn’t have any real game experience and plan to get better over time,” sophomore Elizabeth Ruiz said. The Cavs played a great game, but were just unable to force the ball into the end zone as they got closer. The girls are ready to work harder in practice and make improvements to play even better next time. The girls are looking forward to the rest of the season and hope to make an impact when they get to Districts. 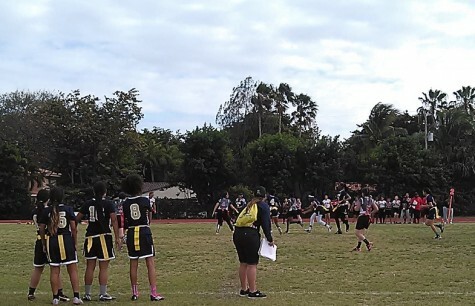 Be sure to support our Lady Cavs’ flag football team during their next game on Tuesday, March 15 as they take on the Coral Park Rams at Coral Park at 3:30 p.m.